To help you not to miss the highlights and monuments of interest and to make your choice, we present you a selection with their history and practical information. You may print this page as a paper guide in PDF format or – better - get in contact with our local partner for an individual and personalized guided tour. The first on the list of places to be seen is the beautiful bay of Geneva: the lungs of Geneva, a place of leisure and strolling, of meeting people from the whole world with the water fountain on the background. In the park called the English Garden (Jardin Anglais) on the left bank, don’t miss the flower clock, symbol of the international reputation of Geneva as the world capital of luxury watch making. 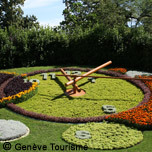 The English Garden is only one of the over fifty parks of Geneva, 2 nd greenest city of Europe. On the right bank, the statue of the Sissi, empress of Austria and Hungary, assassinated on this quay in 1898. Across the street, the original mausoleum of the Duke Charles II of Brunswick built by the grateful city of Geneva for its benefactor. Was installed in 1891 and is thus one of the most ancient monumental fountains of the world, reaching a height of 140 meters. It has become the landmark of Geneva. It is switched on every day of the year from 10h to 23h (at night with lighting) except when the winds are too strong or the temperatures below +2 C°. 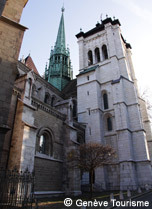 Saint-Peter Cathedral of Geneva has been erected between 1160 and 1250 as a catholic church, but is a protestant church since Geneva had adopted the Reformation in 1536. The inside deserves a visit, be it only for the contrast between the bare cathedral and the corps chapel (Chapelle des Macchabées). A surprise. The chair of Calvin is on the way to the north tower, which offers an exceptional view on Geneva… after 152 steps of a narrow staircase. But your effort will be highly rewarded. Open every day variably according to the season from 9h30 to 18h30 (tower 18h00), Sunday 12h00 to 18h30 (tower 17h00). When renovating the cathedral in the 1970-ies, a fabulous number of extraordinary pre-medieval artefacts was discovered in its basement, transformed into an archaeological museum. Today it is one of the most fabulous of Europe. Open every day except Monday from 10 to 17 h.
This monument 100 meters long was built by a private foundation between 1909 and 1919 to mark the 400th anniversary of Calvin and the 350th anniversary of his Academy. 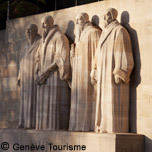 It stands in the park des Bastions and tells the story of the Reformation in Geneva and its international influence. Erected between 1929 and 1936, on a piece of land belonging to the city of Geneva, the UN palace first hosted the League of Nations, the forerunner of the UN. In 1946 it became the office of the United Nations. It contains the biggest conference hall of the world with some 2'000 seats. Every year, some 25’000 delegates from the whole world meet here to negotiate world peace. 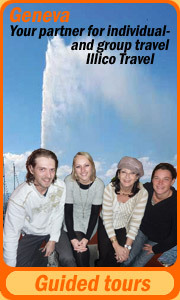 We recommend their guided tours: daily every 45 min. in French, English and German; on request in 15 other languages. How to get there: from the train station tram 13 or 15 or bus 8. Some 25 other international organisations like the WHO, WTO, WlPO, ILO, ITU, etc. have their headquarters in Geneva. Our local partner will be happy to take you around and tell you more about them. www.illico-travel.ch + by LatLon "Guided tours"
The City Hall is an architectural complex built through the 15 C -18 C. The Parliament of Geneva (legislative and executive power) sits in the building. On the ground floor, the Alabama room where the first Geneva Convention (Red Cross convention) was signed in 1864. The first international court of arbitration has also taken place here in 1872. It set an end to the conflict between the USA and the UK after the American civil war . Originally built as a grain store in the 17 C, it became an arsenal in the 18 C and holds today the archives if ancient Geneva. 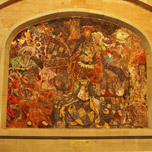 Three mosaics are there to show the 3 important moments of the history of Geneva: the roman period with the arrival of Julius Cesar in 58 b. C., the Middle Age with the Geneva fairs and the Reformation with the arrival of the protestant refugees. This is the most ancient private house of Geneva ( 14 C). 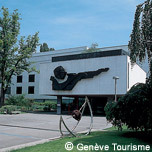 Today, it hosts the museum of ancient Geneva. On the third floor, you can admire the model of Geneva just as it was before dismantling the huge fortifications in 1850. Until that year, Geneva was one of the most fortified cities of Europe. Entrance free, open every day except on Monday. Is a very typical place and the most ancient beach of Geneva. It offers the best view on the bay, the lake and the daily birth of the fountain. In winter, an excellent address for a cheese fondue. It is one of the most unusual, eclectic, cosmopolitan, popular and yet smart places in town . You will love it. 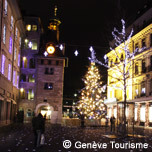 In addition to the most important sites mentioned above, Geneva offers many other places of great interest. 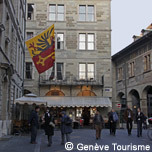 Heart of the Old Town, this is where Geneva began around 500 b. C. It is still today one of the places where the Genevese meet for having a drink together… since 2500 years non-stop. On the Promenade de la Treille you can sit on the longest wooden bench of the world and admire the official chestnut tree announcing spring every year since 1818. At the foot of the Old Town, the place Neuve is a cultural centre with the Opera, the Music Conservatoryand the Museum Rath. Around the corner, on the Plaine de Plainpalais, you will find the flea market on Wednesdays and Saturdays. Among the numerous green areas of the city, don’t miss the 5 parks on the right bank starting from the Perle du Lac to the botanical garden. 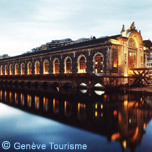 In the part of Geneva called Jonction you can admire the merging of the river Rhone and its blue water with the milky water of the river Arve. Geneva holds a great number of architectural jewels such as the de Clarté glass buildingof Le Corbusier of 1932, the “Smurfs” buildings behind theCornavin main train station in the district Les Grottes. 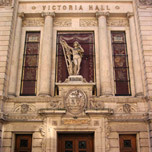 The Victoria Hall is still a famous place for classical music, erected 1894 in a superb neo-rococo style by Sir Barton, British consul of Geneva. He dedicated it to her majesty the queen Victoria and… to his wife, named also Victoria. The Russian orthodox church built in 1866 in a Russian muscovite style, the catholic basilica Notre Dame of 1859 (near to the train station), the Synagogue of 1859 and the Mosque with a minaret of 1974. We invite you to visit the page “guided tours” of our local partner Illico Travel, who can offer you interesting tours – for individuals, families or groups. A few minutes away from the heart of Geneva, Carouge is a charming little town built by architects from Turin during the century of Enlightment. Stroll through the picturesque streets with their original boutiques, pubs and restaurants. To “live” Carouge, a private visit will let you discover the delightful backyards and gardens or have you meet with an artist or craftsman. Trams 12, 13 and 14 take you there in 15 min. www.carougemania.ch will give you more information on the guided visits of Carouge. The generous and varied nature of the region has another surprise in its pocket, a French one: the mount Salève, reachable in 20 minutes from the city centre. A cable car takes you in 6 minutes on top at 1300 m. There, you may choose between hiking, mountain biking and paragliding… or just dining. Bus 8 takes you right to the departure of the cable car. The welcoming city of Nyon, 20 km away from Geneva, was an ancient important « Colonia Julia Equestris ». Roman ruins are still visible and a magnificent Roman museum witnesses of its past. 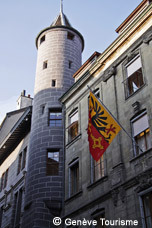 The castle of Nyon hosts a Museum of history and porcelains. 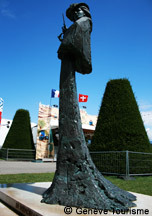 The Museum du Léman shows the history and traditions of the lake. You can easily reach Nyon by boat or train. A day excursion on an ancient paddlewheel line ship may lead you from the bay of Geneva to the quaint medieval village of Yvoire, also on the lake but in the French Haute Savoy. The 14 C fortifications are still standing, and the narrow streets are lined with workshops, restaurants all decorated with lots of flowers. The beginning of the history of Geneva derives from its exceptional geographical position as a crossroad of European importance on the big communication routes connecting the Mediterranean regions with the northern ones. Since thousands of years, Geneva is a crossroad and a meeting place. The first traces of stable human occupation appear 3’000 b. C. on the shore of the lake. The hill of today’s Old Town, centre of the ancient Geneva, was inhabited much later, probably not before 1’000 b. C. As of the 5 C b. C., a Celtic population called the Allobrogians settles down in the region. 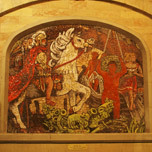 The Romans occupy the place towards 120 b. C. and Julius Cesar arrives in 58 b. C. and it is due to him the first historical mention of the city - in his book De Bello Gallico (The Celtic wars). The Burgundies, the Francs and others followed. Even Charles the great came through Geneva on his way to Lombardi! Part of the Holy Roman Empire early 11 C, the city develops and becomes famous for its international fairs and as of the 15 C, Geneva becomes an important financial place. In 1536 Geneva adopts the Reformation and under the influence of John Calvin becomes a protestant and independent republic, quickly called the protestant Rome. In 1798, after 260 years of independence, Geneva is occupied by Napoleon for 16 years but, finally, enters the Helvetic Confederation in 1815. 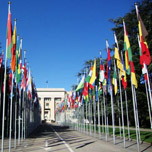 The 20 C crowns Geneva as an international city: appointed in 1919 as the headquarters of the League of Nations, Geneva turns into a place of high level political and economic meetings. Since that time, a growing number of international organizations have established here. 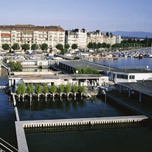 Geneva has become the smallest metropolis of the world. If you are a visitor in a hurry or if you wish to take your time to dive into the history and the local life of this surprising city, the Illico Travel agency offers quality guided tours of all kinds at your path and according to your interest - all with a common denominator: the passion of the guides who make you discover all the multiple facets of the city, between tradition and modernity: fascinating history and monuments, unexpected hidden corners, nature and gastronomy, and …its lifestyle. LatLon-Europe presents a choice of the most remarkable museums for every city, be it a metropolis or a small town. Allow yourself to be surprised by the quality of diversely themed and inspirational museums. To assist you in preparing your travel to Geneva, this page lists the most popular cultural and leisure venues.